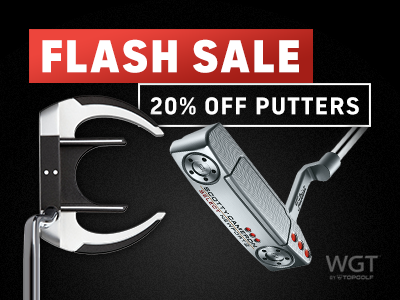 Putters on Flash Sale Now! Upgrade your putter right now -- 20% off in the WGT Pro Shop! Now through Fri, 12/7 buy any virtual putter up to Level 85 (and less than 400,000 credits 😉) for 20% off its regular price. Improved putting, for fewer credits – but only for a limited time! *This special offer applies to all virtual putters up to Level 85 (excluding the MAX CC Putter), and is available now through 12/7/18. Available on wgt.com and WGT Golf Mobile.